Historically, the Palestinian "liberation organizations" have had no ideology or motivation beyond the destruction of the State of Israel. They are proxies of the countries funding them, instead of acting in the authentic national interests of the Palestinian people. Instead of bringing jobs, water and better education -- as they promise when they stand for election -- some Arab Israeli legislators sell out their people for a few crumbs of headline attention. They parrot the Iranian line, with no regard for the needs of their voters. Iran just wants to get its foot in the door. With the generous "help" of our Palestinian leaders -- and especially with the "help" of the treacherous Europeans who keep on enabling them -- any real help for the Palestinians looks more distant than ever. We Palestinians, as a new people on the stage of history, have not yet learned from the experience of those who preceded us. We always seem to be motivated by factors working against us, and let ourselves be manipulated by foreign countries who use us as proxies to further their own interests. We are making mistakes again, one after another. We do damage to the Palestinian national interest and instead of propelling ourselves forward, we push ourselves back. We work against our own best interests by constantly lying. We all know, for instance, that there is no truth to the claim that Jesus was a Palestinian, or when we say that the Jews have no historic links to Jerusalem. We just make ourselves look ridiculous. Whoever makes such claims not only attacks Christianity but also represents the entire Palestinian narrative as a blatant lie. In 1948, when we could easily have established a Palestinian state in the large territories offered by the UN, and instead joined with five Arab armies in an attempt to destroy Israel and erect Palestine in its place. Between 1949 and 1967, we could have established a Palestinian state in the West Bank while it was still under Jordanian control, and in the Gaza Strip governed by Egypt. During the 1970s, instead of thanking Jordan's King Hussein for taking in Palestinian refugees, Yasser Arafat and the PLO tried to overthrow him. The result was a civil war and the expulsion of the Palestinian leadership from Jordan to Lebanon. Once in Lebanon, we set about creating a terrorist state-within-a-state, bent on subverting Lebanese sovereignty and attacking Israel. The Israelis consequently entered south Lebanon, and with the support of the Shi'ites there, we were expelled once again, this time to Tunisia. Under Palestinian influence, Tunisia then became a hotbed of crime and international conspiracies, again endangering our hosts. We are now following the same pattern in Syria. The Palestinian leadership first betrayed Syria's then President Hafez Assad in 1982, when elements of the PLO fought, together with the rebels, against the regime in Homs and Hama. Now, in the Syrian civil war, some Palestinian movements, mainly in the Yarmouk refugee camp, are fighting together with the rebels against President Bashar Assad. Yasser Arafat stupidly supported Saddam Hussein's invasion of Kuwait, a choice that led to the expulsion from the area of 400,000 Palestinian white- and blue-collar workers, and doing untold damage to the Palestinian cause. When Saddam Hussein was defeated and the Iraqis withdrew from Kuwait, the extent of Arafat's mistake became evident. The Gulf States came to regard Palestinians as traitors and alienated themselves from the Palestinian cause, overtly for a long time and covertly -- with the exception of Qatar -- to this day. The same pattern of ingratitude and thick-headedness is also being repeated by Hamas, the Palestinian terrorist organization that rules the Gaza Strip. While totally disregarding what Egypt sacrificed for the sake of the Palestinian cause in its many wars against Israel, senior Hamas officials are now working to undermine Egypt and its president, Abdel Fattah el-Sisi, by supplying the Islamic State in the Sinai Peninsula with arms and training. Hamas, composed of Sunni Muslims, has also become the willing dupe of the Iran, which is Shi'ite. Hamas is therefore openly collaborating with the arch-enemy of Sunni Saudi Arabia and the other Sunni Gulf States. Iran has promised Hamas arms and money to circumvent the Palestinian Authority (PA), in an attempt to topple it. The Iranians are also trying to trying to convert members of Hamas, and eventually all Palestinians, to Shi'ite Islam. Recently, a senior official of the Fatah's Central Committee, Abbas Zaki, spoke out in favor of Iran's plot. His remarks will not only help Hamas in its attempts to overthrow the Palestinian Authority, but could mean the end of Saudi Arabian and other Sunni-Arab Gulf States' support for the Palestinian cause. On March 11, all 22 members of the Arab League officially branded Hezbollah -- Iran's proxy -- a terrorist organization because it collaborates with the Syrian regime in slaughtering Sunnis, has terrorist cells in Bahrain and Saudi Arabia, and fights in the ranks of Yemen's Houthi Shi'ite rebels against Saudi Arabia and other Sunni countries. It has become painfully clear that, regardless of political affiliation, the Palestinian leadership is motivated only by greed -- with no thought to the interests of the Palestinian people. Palestinians did not bypass the Arab politicians in the Israeli Knesset, who are among the worst offenders, as well. As soon as the Arab League voted to designate Hezbollah a terrorist organization, three Arab Israeli parliamentarians, who were elected to represent Arabs inside Israel, condemned the decision. In comical language that sounded as if it had come straight out of the Cold War Kremlin, they said that declaring Hezbollah a terrorist group served the interests of "the reactionary Arab states loyal to Israel and the United States." The objective, they claimed, was to neutralize Hezbollah in order to damage the security of the "Arab nation;" turn the war towards the destruction of Lebanon, and get rid of anything that could stop America and Israel's imperialistic plans for the Middle East in general and Palestine in particular. One can only ask why we, Sunni Palestinians, should support the Shi'ite Hezbollah, which slaughters Sunni Muslims in Syria and subverts Arab states while serving Iran's desire to keep Syria's Assad in power. What do these three Arab members of Israel's Knesset think they have in common with Hezbollah? Why, throughout its history, have the Palestinians been the victims of so many irresponsible leaders who harm their own constituents? What makes the radicals of Hezbollah more appealing to some Arab Israeli legislators than the radicals of ISIS? Do those honorable Arab Knesset members not understand the damage they do to the Palestinian cause by challenging the Sunni Arab states, which have contributed so much to us -- both politically and economically -- over the years? Historically, the Palestinian "liberation organizations" have had no ideology or motivation beyond the destruction of the State of Israel. They are all proxies of the countries funding them, instead of acting in accordance with the authentic national interests of the Palestinian people. In the instance of the three Arab Israeli legislators, they evidently followed instructions from the Iranians. Instead of bringing jobs, water and better education -- as they promise when they stand for election -- they sell out their people for a few crumbs of headline attention. They self-importantly parrot the Iranian line with no regard for the needs of the people who voted for them. They cynically exploit their parliamentary immunity and the defense provided them by a country they call their sworn enemy, in order to support Hezbollah and Iran, which are comfortably manipulating them. Iran just wants to get its foot in the door. That is the reason the Iranian regime is so persistent in courting the Palestinian Islamic Jihad and Hamas, both Sunni organizations (as well as its own Gaza proxy group, Al-Sabireen), while it slaughters Sunnis in Syria and Iraq, and puts agents in place to overturn the Sunni governments of Bahrain, Yemen, Saudi Arabia and the UAE. Can Iran's plot possibly be a secret from the Israeli Arab Knesset members, whose support of Hezbollah harms the interests of the Arabs inside Israel? Have these three members of Knesset forgotten the thousands of missiles Hezbollah fired into the Galilee, where so many Israeli Arabs live? Do they not understand that if Hezbollah leader Hassan Nasrallah carries out his threat to bomb an ammonia installation in the Haifa area, thousands of Israeli Arabs will be killed? With the generous "help" of our Palestinian leaders -- and especially with the "help" of the treacherous Europeans who keep on enabling them -- any real help for the Palestinians, and the top of our mountain, look more distant than ever. Hezbollah leader Hassan Nasrallah recently threatened to launch missiles at an ammonia installation in northern Israel, which could kill tens of thousands of civilians -- including thousands of Israeli Arabs. With articles like this from Arab contributors there can be no excuse for not understanding the continuing unrest in the Middle East even though sick Europe tries hard to convince us otherwise. Personally I think the best and only sensible answer to this situation is for majority rule to take it's rightful place in Jordan and then it will become the national home of yet another Arab entity. And name it Jalestine or Palordan. Either way I have my doubts whether they will ever be content with their lot if history is anything to go by. Mr Tawil has hit the nail on the head, the problem are the leaders, until the Arabs accept that Israel is NOT occupying Palestinian non-existent land there is no solution. The majority of the non Israeli people who live in Israel are Muslim who submit to Al Shari'iah, the law of Allah, His Name be praised. The core of this law is Jihad, the war against non Muslims. At the top of the list of non Muslims enemies are Polytheists. They are very rare in Israel. The next are the Jews. There are Jews who are on a contract to submit to Al Shari'iah. They are called Dhimmis. These are extremely rare in Israel. Then there are non Israeli Jews and Christians. They are relatively safe in Israel but not in many other Muslim countries where polytheists and Jews are absent or extremely rare. The group that is a real problem for non Israeli Muslims are the Israeli Muslims. According to Al Shari'iah they are Apostate. Apostacy is an enormity punishable by death. But many are family of the non Israeli Muslims. The 'niggers in the woodpile' are the Israeli Jews. They have the audacity to occupy land that was Muslims occupied before. That means that they are not only non Muslim and must be killed but also because they occupy Muslim land, which is another enormity punishable by death. A very large proportion of Israeli land was purchased by the Zionists from the families of Muslim leaders who made a lot of money doing this. Muhammad, the Messenger of Allah was a 1/5 th share for the leader. This is the model followed by subsequent rulers who represent Muhammad in their fiefdoms. Most embarassly are the thousands of non Israeli Muslims who have applications to become Israeli because they realise the advantages of good government. Al Fatah and Hamas. But there are numerous other groups also. To Muslims the Jihad against non Muslims is one thing, but Jihad against Apostates, that is other Muslim groups, is an all consuming passion that is fought over with great gusto. These are not just a problems for the non Muslim people in Israel. The whole Muslim community suffers from these and many other issues. It is not possible to change because Al Shari'iah is from Allah and thus absolute. The only option is to reject Al Shari'iah. "Politics is the art of the practical" - Wm Pitt the Younger who also said, "British policy is British trade." Other genuine nations have established states - and the economies to support them - without having first gained all the territory claimed. *Italy became united and independent in 1860 with French help from N III but had to leave Rome for a capital in Florence till in 1870 when the French withdrew from Rome because of the NIII defeat by Prussia. *Federal Western Germany was created after WWII with a capital in the Cologne suburb of Bonn because the East Germans had Berlin. *Ireland though independent in 26 counties since 1920 has got on with the rest of its life without the Six Counties of the North that prefer to remain British. *Since 1949 China has lived without Taiwan/Formosa - rather well. *The USA's first federal capital was in New York City till Washington DC was appointed. Similarly Pakistan's capital was initially in Karachi. *When Ireland walked out of Britain the country did not fall apart. Similarly when Pakistan walked out of India and Bangla-Desh out of Pakistan. Ditto Poland and the Baltics from Russia; the Balkan and Arab states from Ottoman Turkey; Portugal from Spain, and Norway from Sweden. It really is time for the Arabs of Palestine to let Israel go and make their own nation state and economy. It's always refreshing to hear an individual address truths over the incessant lies we hear from the media and the uninformed. But the biggest truth is, as some mentioned already, is that there has never been a Palestinian state or nation. The word Palestine was a misspelling created from the word philistine, by an early Roman historian. This was actually in 4th-5th century BC. Later, Josephus, the Jewish historian addressed the misspelling in an attempt to clear it up. After the destruction of the second temple it was ordered that the area of Israel be called/named Palestine in an attempt to remind Israel that not only had Rome conquered Israel but they also believed they had defeated Israel's God. It was always intended as an insult to the Jewish people. Further truths are that many Arab leaders have publicly stated that there has never been a Palestinian state and that there is no such thing as a Palestinian Arab, just Arabs. Auni Bey Abdul-Hadi, Syrian Arab leader once said "There is no such country as Palestine. Palestine is a term the Zionists invented. There is no Palestine in the Bible, our country was for centuries part of Syria. Palestine is alien to us. It is the Zionists who introduced it." Jordan's king Abdullah, in 1948 said," Palestine and Jordan are one." Professor Phillip Hitti, an Arab historian, has stated," there is no such thing as Palestine in history, absolutely not." A Saudi Arabian representative to the UN once said, " it is common knowledge that Palestine is nothing but southern Syria." These are but a few of the many Arab leaders that have publicly denied the existence of a Palestine or Palestinian Arab that is separate from all the other Arab people. In truth, if they wanted a Palestinian state they already have one in the nation of Jordan. Nearly 75% of the land referred to as Palestine in 1948 was given to king Abdullah of what was then called trans Jordan. On August 23,1959, Hassan' al-majali, prime minister of Jordan declared," We are the government of Palestine, the army of Palestine, and the refugees of Palestine." The truth as stated by Palestinian politician Zouhair Moussein in 1977," The Palestinian people does not exist. The creation of a Palestinian state is only a means of continuing our struggle against Israel..." Taken from an article in the Dutch newspaper Trouw, from an interview in 1977. The reason they continue to struggle is because their whole argument has been based on a lie designed to bring about the destruction of Israel and the Jewish people. Unfortunately for the Arabs involved, their well being or lack of it, is of little consequence to the false leaders claiming too only want what's best for their Arab brothers. This is arguably the greatest lie ever and the victims aren't only Jewish but Arab also. All lies eventually come to light, and the sooner the better, especially this one. Nobody cares about the Palestinians, not even themselves! The world main concern is undermining Israel. About this every body cares a LOT. It has been said many times that a country gets the government it deserves, and very clearly "Palestine" demonstrated that spectacularly well. When the "Palestinians" love their own children more than they hate Jews, there may be some hope for them. Mr. Bassam Tawil's article is interesting but the origin of calling Arabs "Palestinians" dates to 135 A.D. when the Roman Emperor Hadrian defeated the last Jewish rebellion under Bar Kochba. He changed the name of Judea to "Palestina" - he also outlawed Judaism and renamed Jerusalem "Aelia Capitolina," "Aelius" being his gens name. Since then, the terms "Palestine" and "Palestinian" have meant "land of the Jews" and "Jew." That is why, after World War I, Great Britain was awarded the "Palestine Mandate" to be "the homeland of the Jews." In 1954, in Cairo, Gamal Nasser, ruler of Egypt, and the Soviet Union, both haters of Jews, formed the "Palestine Liberation Organization' (P.L.O. ), whose name shows its Soviet origins. It came to name when it massacred the Israeli athletes at the Olympic Games in Munich in 1972. Since that time, Arabs have been called "Palestinians." Since Israel was restored in 1948 and the numerous stupid and ineffective attempts to destroy it - failed miserably. The Arabs have never even tried a peaceful approach. They pretend, lie, sign agreements that they immediately break and as a result of the UN and its members failure to condemn terrorism and violence against Israel, they still think that All will be well once they have killed all the Israelis. How dumb can you get? Try directing gifted funds to turning Gaza into a tropical paradise and an international business and trading centre. Build a tourism industry, educate the young so that they can work productively, building rather than destroying. Then you have a basis for a technological alliance with Israel, who, are very good at research, science, manufacturing, agriculture etc. Only the money diverted to the private accounts of their corrupt leaders who encourage violence rather than peace can explain this. It's all about corruption and the love of money. There is a deeper reason for the "historic betrayal" of the Palestinians than the 'greed' of their rulers. The deeper (much deeper) reason is that they have not faced the existential question that all Muslims worldwide may have to face if the indiscriminate terror from 'radical' Muslims keeps growing and becomes even more widespread - regardless of the fate of ISIS, which is only the most visible and immediate face of that threat. The existential question for every Muslim is - do you want to be a Good Muslim, or a Good Person? Because it is clear, or should long since have become clear, you cannot be both, but must choose. submission-to-Islam tax, or be killed. A Good Muslim believes that all women on the planet should be covered head to toe, because otherwise they are an unacceptable source of evil temptation to men. A Good Muslim believes that Blasphemy, Apostasy, Adultery by women (but not men), and Homosexuality must be punished by death. A Good Muslim believes that any "insult" to islam, or to the "Prophet", must be punished by death. A Good Muslim believes that Jihad, the indiscriminate killing of all 'enemies' of islam, all Jews, all non-muslims, and all 'heretic' Muslims is the most acceptable path to the Paradise of Islam. And in Jihad there is no such thing as collateral or civilian damage. A Good Muslim believes that all 'man-made law' by any people anywhere on the planet must be replaced by 'divine' Sharia Law. A Good Muslim believes that any form of lying or dissembling is morally permissible if it advances the cause of turning all humanity into "slaves of Allah". A Good Muslim therefore believes that it is wrong to have a conscience and a contemptible sign of weakness to follow, or at least try to, the Golden Rule toward all people. ACT on these beliefs. But it is unquestionable that hundreds of millions of Muslims believe in some or all of them (and belief in any one of them raises the Existential question). Good Persons accept or follow NONE of these beliefs. So a question of our Age, perhaps the question of the Age becomes: will Muslims face the essential existential question of their identity: Do they want to be Good Muslims, or Good Persons? For they cannot be both. Consider the case of Fareed Zakaria, who when asked some time ago if he was a Muslim, gave the off-center answer, "I've never considered myself anything else". He has not grown a beard. He has said women should have the choice whether to wear head, face, or body coverings. How could a Good Muslim possibly follow (avoid) such practices and come out with such statements? ... Bad Muslims, out of step with the great majority of Muslims in the world. They mistake the Exception for the Rule. Such deep inconsistencies haven't stopped Zakaria (like others) from continuing to be an apologist for Islam, although with more strain as the crisis in Europe builds. He has stayed with the "tiny minority" thesis - but he has also recently referred to a "cancer" in Islam. (I haven't heard any Jew or Christian refer to a "cancer" in Judaism or Christianity). He said last week that "radicalism" by young Muslims, in the form of a life of crime, "precedes" their conversion to "radical" Islam. But this ingenious and slightly brazen rationalization is pretty thin, especially if one points out the obvious, that no other criminals anywhere have moved on to become suicide killers. So maybe Mr Zakaria is slowly, perhaps even unconsciously, facing the existential question, and choice, of whether he can remain essentially a Good Person, or will have to give up his religious identity. It's the personal story of a high-visibility Muslim I'll go on watching. Or maybe he'll just muddle along, clinging to and retaining the identity, however clearly he is behaving as a Bad Muslim. I am just wondering whether any of this reaches those who are being duped: not only the Palestinians but people and governments in the Western world? In my humble opinion and referring to encyclopedias, history books, Middle East and foreign medias : Palestinians and their leaders made regretfully since 1945 an enormous string of errors -- tactic, strategic, social, economic, governance, political, diplomatic, military -- incredibly, big, big errors. Also 1) their vision and options weren't pragmatic at all and 2) they were sorrowfully followed by silly advice plus very bad luck. What will/should the West Bank be like in 2050? The favourite football of their own leaders who use them as their personal army of human ammunition. The favourite football of the Arab league who use them as a diversion of their own failures to their people. The favourite football of terror group leaders who would sink back into anonymity if not "the cause of Palestine". The favourite football of hundreds of NGO's who's members (usually losers in society) use them as a tool to add some importance to their empty lives. The favourite football of journalists, writers, singers & actors who want to be/stay/become famous. The favourite football of the EU who uses them to vent their obsessive Jew hate in the name of 'Human Rights for Palestinians'. But Mr. Tawil, the problem is not the 'historic betrayal of the Palestinians', but the self delusion of of "the Palestinians and their historic rights"! When lies will stop ruling the world & the lives of Palestinian Arabs, than they can carve a better future for themselves. 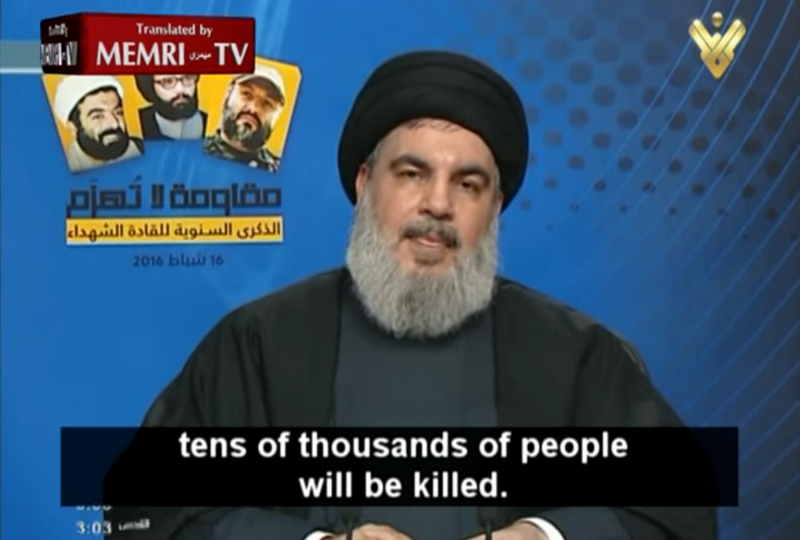 Hassan Nasrallah had better watch his mouth as he'll never know what hit him if he carries out his threats or pursues this kind of rhetoric much longer. This Hezbollah leader should be hunted down by a hit squad and put this heathen barbaric out of his misery. God Bless Israel and all those who support her. There is a long history of fighting of the "Palestinians" (who are mainly children of Esau, Jacob's twin) among themselves. In Sefer Yahshar / Scroll of the Upright / Book of Jasher, which is supplementary to the books of Moses, chapter 57, verses 27-40 and context, the children of Esau were going down in defeat to the Horites and their allies, and some of Edom then helped the enemy. Therefore they were dealt harshly with after the battle, and Edom decided even to elect a foreign king rather than trust one of their own to rule over them. Therefore it seems that the enmity among the "Palestinians" is almost as old as the enmity between Jacob and Esau. Palestinian leaders have no interest in a state of their own. Theirs is an honor society, and the great stain on that honor is the fact that the Jews, who the quran proclaims are lower than dogs, have a state of their own. Moreover it is a prosperous, democratic, humane state in which the standard of living of the Jews is higher than that of the Muslims in neighboring states.This situation is unacceptable. It puts all of the teachings of the prophet in doubt. Israel, therefore, must be destroyed. After that . . . well, who really cares? Palestinian leadership from the date that Israel became a nation has not really been interested in forming a Palestinian country, its only function was destruction of the Jewish state. The offers made from Israel have been answered with intifada. On one occasion even the Saudi's said take this offer you will never get a better one, and the reply was to callout the intifada. Things will never change whilst the present leader of the West Bank, who was a colleague of Arafat remains in office. It is no coincidence that peace with Israel has occurred with Egypt and Jordan. Resulting in no war across these borders. The Palestinians will get what they want when they put in a leadership that is interested in the future that people. At best the Liberation of Palestine's goals beyond the destruction of Israel are secretive. One explanation for this subversive end to obscure what Palestinians might aspire to is that their aspirations themselves are questionable. On the one hand they follow teaching like the Mufti of Jerusalem's hate Jews and kill them all lessons he learned and helped implement in WWII Germany as a guest of Himmler. They also have the Socialist National and international state socialism teachings of the Muslim Brotherhood. But socialist nations have failed one after the other, and with exceeding brutality marked by genocide and mass murders, deportation and like crimes against humanity. How do they adjust their paradigm to resemble any sort of progressive revolutionary movement? They place the blame on the West and have retreated into Islam to find a solution and that solution is proving to be even worse. Can this mental disorder runs its course, can it reach a plateau where the epic exodus from the Middle East and the genocide that is on going against minorities and the other sadistic symptoms of theocratic tyranny be reformed? I no longer believe so, mainly because of people like President Obama who rather than encourage reform has spent the last seven years encouraging and standing by while radical Islam grew out of all proportion and is now a greater threat by a factor of 10. Why single out the Palestinian leadership past and present? The attitude shown by the Palestinians isn't much different from most western so-called "Democracies". We also have a big problem with leaders, who care very little, if at all, for the citizens of their country. Politicians are the same, no matter the background! With the Palestinians wanting to rid the world of Israelis, we have many westerners, who also have this thing about the Jews. In all probability they have friends who are Muslims, or have been brainwashed into thinking that the Jews dominate in all Western countries and are pulling the strings. This is of course madness! The one and only reason that the Jews are being singled out is very simple, they are never going to be in the position whereby their people are subject to persecution and genocide, by any others. In particular they will never bow to Islam, unlike the cowardly Western politicians who are actually inviting Muslims into Europe and letting them gain a footing in order that they can launch an all out attack on Christianity in the near future! Accepting truthful reality is a major step to any solution. New people as from 1880 for the most part being the economic migrants that came for jobs and augmenbted local Arabs; The Jewish ancestral home for millenia and ever is the land of Israel. There has been an equivalent population exchange on ethnically cleansing Jews from the Middle East. The new people have been used in 2 ways; As a tool to fish in the muds of the Middle East to control the oil, and as an instrument to push back the Jews who murdered Jesus and poisoned Muhammed. Twice a Two State solution was effected : Transjordan and Gaza; A Lateral solution that ought to solve all but the esoteric issues is accessible; Greater Gaza as augmented by Egypt's generous gifting of additional land, an international Marshall Plan to redevelop the enlarged Gaza, home to the biblical phillistines, to build sustainable economy around Hotels and leisure, Agriculture, Fishing, providing homes, jobs, schools hospitals as well as given a genuine acceptance by Arabs, disarming Greater Gaza in exchange for Airport and sea port, for a life happy ever after, with self respect and a purpose in life ending the hate. Palestinians probably ought to be stabbing their political representatives and not the Israelis. But stupid is as stupid does. Surely, at least a few of them must know what their "leaders" are really doing. NOTE: "...Bassam Tawil is a scholar based in the Middle East..."
And after writing so honestly, he is still alive...? Surely he lives in Israel... Is there anywhere else that he could possibly be safe? Mr. Tawil, once again your brilliant analysis hits the "nail on the head". I dare the Palestinians, including those who forget they are Israeli Arabs, to understand and accept the truth of this article. 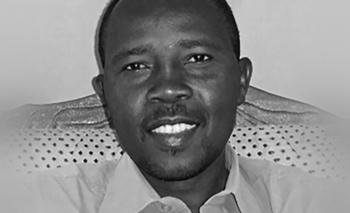 Bassam Tawill gives a history lesson that President Obama should spend nights learning and absorbing. Actually, maybe not! Barack Hussein sees the Arab world as the victims of the USA according to what he learn from Pastor Wright for twenty years. He would "understand" why "The Palestinians" hate the USA and cheer every time Islamic terror strikes in the USA. "The Poor "Palestinians" need his help against the "Apartheid" Jewish state. Trump apparently knows more about the Middle East, Islamic terror that Barack Hussein who refuses to even call it Islamic terror.